We've been hearing a lot about a Clapham High Street bar - 'The Loft' , so naturally curiosity got the better of us and Aspinal of London decided to check it out. But be careful not to walk past and miss it! It is situated on the first floor, with a bird's eye view of the infamous madness of Clapham High Street, especially on a Friday night. (For those who are directionally challenged -above Tesco Express). Up the stairs you enter a much swankier space. The venue is closer to a lounge rather than a traditional bar, with groups of cosy couches on one side of the space and tables on the other side. And a very lonnnggggg bar. Which throughout the night came in handy, as it gets rather busy. The Loft is very proud of their menu, and so they should be. Being a Bar you wouldn't expect their menu to be quite as extensive and tasty as is it. I ordered off the 'Fingers not Forks' menu and picked 5 dishes....It was busy day at work OK! I picked Halloumi, Lamb Kofte, Pigs in Blankets, Pulled Pork and Patatas Bravas. This modern take on Tapas was right up my street. Great for sharing (if your a sharer..) otherwise if your anything like me your gobble it up all to yourself or perhaps a well thought-out 'swap' with your friends- for dishes you wished you picked. I have also heard a great deal of admiration for their cocktail menu, they also offer happy hour of 2-4-1 which runs until 9pm on Fridays. Also award winning cocktails according to a proud member of staff. After that useful piece of information I picked 'Ladyboy Mojito' and' Passionfruit Cosmo'- My verdict- delicious! There is also a great selection of international draughts and bottled beers - for the Gents. I was part of a group that booked a table for a friend's birthday celebration. I was very impressed with the bartenders who were friendly and quick, despite there being a fair few of us. And being at work all-day we were hungryyyyy group of ladies. 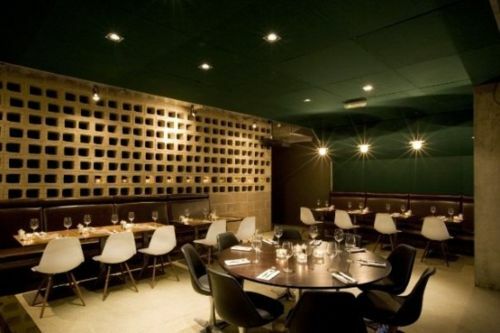 The Loft has quickly established itself as one of South London's favourite bar-restaurants. with great rustic decor and atmosphere we found ourselves enjoying our first 'Loft' Experience. We left stuffed of amazing food and with a slightly cloudy head from those delicious but strong cocktails!